Hopefully you saw the World Cup kit-tracker in June and July – following the success of that (you have to take our word for it, we accept), we have decided to do the same for the Premier League season. This will be a collaboration with Football Kit Geek, who does such great work on his blog. Having lost 4-3 to Arsenal in the opening game of 2017-18, Leicester again got off to a Friday night losing start away from home. Paul Pogba put United ahead with an early penalty before Luke Shaw doubled the lead while Jamie Vardy got a late consolation for the Foxes. Both sides were in adidas – the first time since 1989 that United started the campaign in an all-adidas clash – with United in the black shorts and primarily red socks which are now first-choice. Goalkeeper David de Gea wore an all-green kit similar that which he had for Spain at the World Cup but in a different shade. Leicester have taken to wearing change kits when no clash exists in recent years, but they were in all-blue for their first game in the three stripes. White was probably not the best choice of colour for the sponsors’ logos on Kasper Schmeichel’s shirt. For the second year in a row and third time in seven seasons, Tottenham began their campaign at St James’ Park. As with this campaign, Tottenham have had navy change strips for the other two opening weekends on Tyneside – they wore navy-white-white there in 2012-13 and in 2017-18. On occasion, though, they have worn their home kits there too, as in 2000-01 and 2005-06. This time, though, Spurs wore their new third kit, somewhere between teal and turquoise, featuring a satellite view of North London on the body. While Hugo Lloris wore a Nike kit in the same style as that which he had as France won the World Cup, it was in orange rather than yellow or pink. As previously mentioned, Newcastle’s kit is notable for the inclusion of white socks, while red numbers are retained on the striped backs and also on the black shorts. Bournemouth are in their second season with Umbro and it’s a smart, gold-trimmed kit for them this season. Asmir Begovic was in the new Umbro goalkeeper template, which carries an irregular zig-zag design – on lighter-coloured shirts it’s on the sleeves, but it features on the body of darker tops. Referee Kevin Friend had a similar colour to Begovic but the world continued turning. Cardiff’s is similar to Leicester but without the gold trim and a different pattern running through the fabric. Fulham’s shirt calls to mind the adidas strip they wore two decades ago. Palace’s shirts are in the same round-neck template as what Switzerland had at the World Cup, with the red stripes grading to blue via a series of diagonal cuts which grow larger, creating a fade effect. Goalkeepers appear to have been an after-thought with regard to sleeve sponsors – on the shirt worn by Palace’s Wayne Hennessy, the ‘All Football’ text was white on white. While all of Umbro’s top-flight strips have common elements such as the sleeve taping, they are all unique and Huddersfield’s is a very smart offering, apart perhaps from the strange neck style. Huddersfield’s sleeve sponsor is Asian media company Leisu, with their logo encased in a circle identical to that used to house the Premier League lion on the other sleeve, but with pink used instead of purple. Yellow Chelsea away kits are always appealing, though the use of blue socks means they have two very similar sets in that colour, with the home alternative socks blue with red and white trim. Watford have switched to black and yellow stripes this season, and while there is some red thanks to the sponsor logo and numbers, a bit more would have added to it. Brighton are back in white shorts for the first time since 2010. They have both yellow and black goalkeeper kits in the new Nike style but both clashed with Watford so Matthew Ryan wore last season’s strip, featuring the old American Express logo but with the JD Sports sleeve sponsorship – the same as Cardiff – added. Wolves’ new kit is in the adidas Condivo pattern, used by many teams – including Wanderers – as an away strip, however the old-gold shirts don’t have the multi-rectangled pattern. The body of the Everton shirt features a ‘heather’ pattern. After last season’s 1980s tribute, Southampton are back in more traditional stripes – the widening around the Under Armour logo won’t be to all tastes – while primarily black socks return. That meant that Burnley had to pair their white shorts and socks from the third kit with the black away shirt, the only team to wear alternative shorts or socks on opening weekend. The shirt features a hexagonal pattern which lightens from black to grey. Their goalkeeper Joe Hart took a scissors to the sleeves of his shirt. Liverpool have stuck with the darker red of 2017-18. The shirt has many of the trappings of the New Balance shirts seen at the World Cup, with the front featuring a series of quadrilaterals made up of diagonal lines. 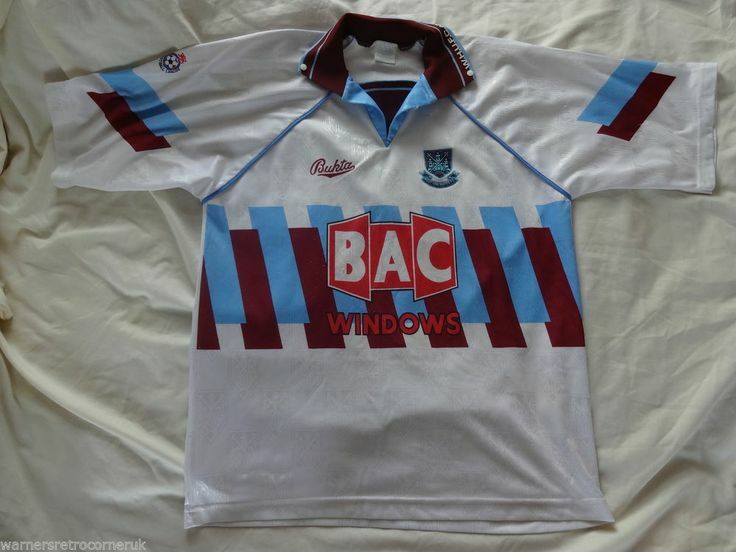 The sleeve trim on the West Ham third shirt is said to reference their 1991-92 away, but they didn’t go the whole hog and add the diagonal lines from the front. Using grey rather than white gave the shirt a washed-out effect. Another goalkeeper/referee colour-clash with no calamitous results. Arsenal’s new shirt has sleeves and shoulders flowing to the neck in a not-unappealing design, but the narrow stripes on the sleeves and socks make for a pink effect. The PR blurb for the Manchester City away mentioned the 1999 Division 2 play-off final, but it’s a tenuous link. As referee Michael Oliver is on the international panel, he is able to carry the Fifa referee’s logo on the right pocket of his shirt. Always gutted when Spurs lose it with any of their kits. Quite like Watford in stripes actually and West Ham’s Anfield get-up was a million times better than their performance. But Chelsea’s yellow-yellow-blue – no fuss like their bog-awful home kit – and Brighton’s new home strip win it for me on Weekend No 1.